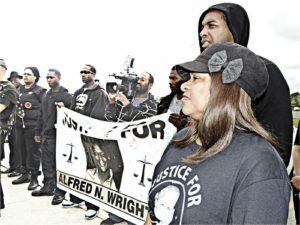 Home » Coast to coast » Justice for Alfred Wright! Stop racist lynchings! After the dragging death of African-American James Byrd Jr. in 1998, three white supremacists were convicted of one of the most heinous racist murders in the U.S. since 14-year-old Emmett Till was murdered in Mississippi. Just as people learned about Money, Miss., in 1955, the East Texas town of Jasper was known around the world in 1998. East Texas, long known for its racism and active Ku Klux Klan terrorism, has made headlines again. A young Black physical therapist named Alfred Wright called his spouse on Nov. 7 to say his truck had broken down. The 27-year-old had recently begun doing home visits in Jasper and neighboring counties. When his family went to pick him up in Hemphill, an hour from Jasper, he had vanished. The next day his scrubs and watch were found on a ranch near where his truck had broken down. The Sabine County sheriff, police and firefighters began searching for Wright, but after only four days they said they’d run out of funds and called off the search. 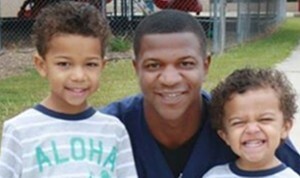 Alfred Wright with his two children. Wright’s family and friends began their own search and found him 19 days later. His mutilated body was on the same land that had supposedly been carefully searched. Left wearing only his boxer briefs, Wright’s left ear had been cut off and his eyes gouged out. Three front teeth and his tongue were missing, and his throat was slit. Yet the medical examiner ruled his death an accident due to drug overdose. Officials from Sabine County have refused to release their autopsy report while there is an ongoing investigation. They say Wright’s body was riddled with drugs, causing his death. His spouse, family and friends say Wright, a fitness enthusiast, never used illegal drugs. The Wright family, community members and other supporters have held several events, including prayer groups and rallies. In February, the U.S. Department of Justice was asked to investigate. On Feb. 15, the New Black Panther Party from Houston held an armed “Justice for Alfred Wright” protest through downtown Hemphill, raising a lot of media attention. The Wright family came to Houston in March 20 for a press conference outside the Texas Department of Public Safety, demanding a meeting with the DPS head. Alfred’s mother, Rosalind Wright, said that her family will not give up until they find the killers. Later that evening, there was a public forum with Rosalind Wright and Houston activists as well as a conference call with the families of Emmett Till, Trayvon Martin, Oscar Grant and other victims of racist violence. Plans were made to hold a protest outside the Department of Justice in Washington, D.C., in August and to take all these cases to the United Nations in November. On April 7, a demonstration was held in front of the Texas Rangers’ office in Jasper. The Wright family and Jasper community members were joined by New Black Panther Party activists from Houston, Dallas and Newark, N.J.; the National Black United Front; the Nation of Islam Mosque 45 in Houston; and the Texas Death Penalty Abolition Movement. Tempers flared as activists tried to enter the building to speak with Ranger Danny Young, who was assigned to the Wright case. More than 30 Texas DPS troopers forced the militant crowd back, pushing and shoving until an 84-year-old woman, Jean Dember of the NBUF, was knocked to the ground. Later the group went to the Wright family church in Jasper for a community meeting, lunch and speak-out. Several of Alfred Wright’s lifelong friends talked about how their lives have been affected by his death. Pastor Celmentine King of Jasper told the gathering, “When my brother was lynched in Jasper, we never found out who did it. This time we must!” She said her brother, who had a white girlfriend, was castrated, hung and his body mutilated. One of the men who found Wright’s body was Yahtorah Kupenda, who noted that the skeletons of a Black mother and her son were found three years after they disappeared in Jasper. The medical examiner said the mother had had a heart attack. “We are dealing with demons and they cover up their evil deeds. This struggle is far from over,” he said. Leaving Jasper, this reporter noticed a huge Confederate flag flying high in front of a home on the main highway. 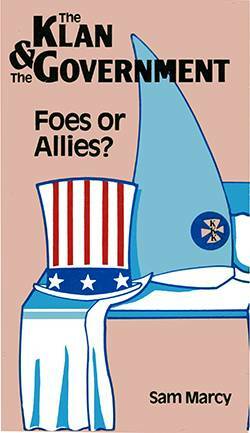 There is no doubt that a united struggle is needed to eradicate the racism of East Texas.